I can't comment regarding a midget buried at Lakeside, however I do know of a guy who buried a late model on his farm. Dean Cummings, gandson of the late Bob McDowell owner of the #14 Lakeside modified, did just that. I don't remember all the details, something upset Dean. It may been a decision CNS made that he didn't like or a problem with the engine or chassis. But he took a backhoe, dug a hole, and buried the car on his farm. This was not some old tired beat up sled. It was a current edition Howe. I heard this straight from Dean himself. I want to say this was sometime in the late '90's. I know I've owned cars that I would have done that to, but never had the chance. By the way Dean is not given to making up stories, if he said he did it, he did. Maybe Fastway could chime in on this, he knows the story better than I do. Last edited by lakeside #29; 11-19-2011 at 11:25 PM. 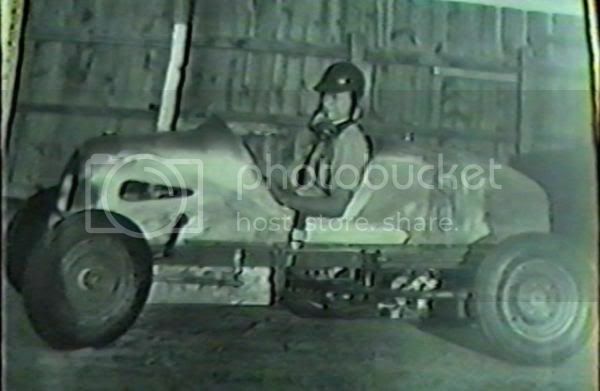 My dad, Ronnie Lee, once told me about a midget racer that had killed too many drivers (I don't remember if he said how many), so they decided that it should be buried and never driven again. Daddy said that they buried it where the trash containers stood. I think that was on the end where the pits were. This race car, Walt Killinger's #8, is NOT buried in the parking lot at Lakeside! It was a very difficult, if not impossible, car to drive. This rear-engine, rear-drive outboard was built from scratch by one of the most experienced and capable engineers involved with Midget Racing in Denver, Walt Killinger. An early driver, in both Midgets, Big Cars, and the Pike's Peak Hill climb, he graduated from the Colo. School of Mines, with a degree in Metallurgy. Several drivers, including Joe Giba, (who got out of this car to drive K&L's #67), tried to make it work, but it wouldn't handle for anyone! It was the car that Powell Lewis was driving, when on the 23rd. lap of the Main event, he spun in front of Pete Hedrick on the south turn, and was forced into a light pole, crushing him in the cockpit, resulting in his death, in 1946. The attached picture displays the damage. Killinger was so shaken by the accident, that he took the car home and cut it up, and didn't salvage anything. He never ran another Midget at Lakeside. As far as anything being left behind after the Races, Ben Krasner had a strict policy that the Track, pits, parking lots etc., had to be emptied by midnight, so that the Park employees could clean up, NO exceptions! The CARC guys on this site should remember this well, as they always had to scramble to get all of the, "Hoolligan/Destruction Derby", Junk out of there ASAP!! I see that the photo didn't get included with my post. So let's try again. Wow, thanks Wayne for the detailed info and photo.....and so, we can now finally put the "rumor" to rest. I must admit though, this has been a pretty tasty thread! Wayne: do you have any further details of Powell Lewis' fatal accident? Especially the date? I found this forum while researching the 1946 Pike's Peak climb: is it possible that Killinger drove this car there himself? Also - thinking laterally - could the "buried car at Lakeside" story be a confusion with the death of George Robson at Lakewood in 1946? Floyd Roberts had been killed in the same car at Indy in 1939 and afterwards Cliff Bergere cut it up with an acetylene torch. Some versions of the story have him burying the parts. Powell Lewis, (a.k.a. Lew Parsons), was killed in July, 1947, and I'm not sure of the exact date, as they were running three nights/week back then, and the newspaper results weren't always dated. 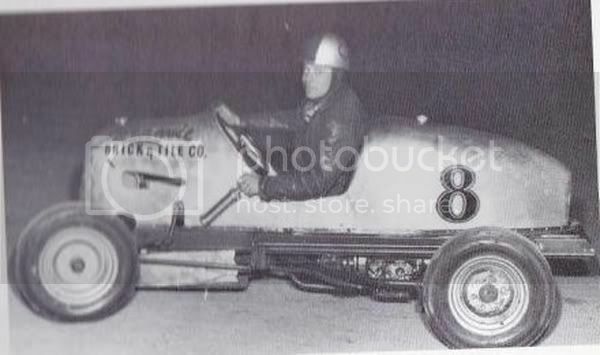 He was a very popular driver, but not able to keep a "good" ride, as he had switched from the Buddy Martinson Offy #1, to get into the Killinger Elto #8 that night! Incidentally, Walt Killinger did drive his Miller Big car at Pike's Peak in 1946, finishing 3rd, his best finish of his 15 attempts, from 1931 to 1953. Powell Lewis died in a Denver hospital from injuries suffered in the wreck on July 7, 1946 He did not realize how serious his injures were until he was pulled from the car. Joe Giba had been the driver for this this car and was listed in the program as driver. Joe Giba in top photo(superstroke has a better res pic) his regular ride until he got sick one night, yeah, Jerry Lee that is Harold Ridell bottom photo. Think it was earlier than wreck 7/7/46 when Powell Lewis/Lew Parsons met his end. Also have (strangely) heard of the elephant buried story but think it was at King Soopers lot at 20th & Depew from family/books. Maybe two stories combined?